My next escape (and my first blog adventure) has been booked! I will be traveling for 57 days filled with anthropological experiences, 256 bit colour, hit hard by ultraviolet sun rays and spiritual healing. It has been my dream for a long time to visit this country, as my great-grandfather once lived in southern India before jumping on a ship one-way for Fiji to work on a sugarcane farm. He never looked back. It was a big cost to him however, as he was cut off from his family thereafter. But the foods, spices, dress, colour continue to resonate in my family. When I was younger, I was quite ashamed of my heritage. I think it was because there was quite a prejudice in Australian society in regards to people of indian heritage. Economics was not my strong point. I did love coming up with business ideas, and was naturally good at math, but I much preferred socialising and dancing with my friends.. It wasn’t of relevance to me to really understand the roots of my culture, I was living in the world of the 21st century where us half-caste kids were often questioned about our ethnicity, but we just wanted to fit in with everybody else. I have traveled to many a country by now, and have had my own prejudices challenged, as well as opening my mind to different ways of thinking, living and being-not to mention tasting flavours once unknown to my tongue! I am so excited to go on another crazy adventure and gain a deeper understanding of Indian culture. I hope you enjoy the posts to come, as I share my own photography, stories and experiences that I know will change me forever. So thankful for life. The winds and the seas will roar, but the sun will always rise again. Today I met a girl Priya, who is roughly 14, but she was only 18 months old when the tsunami hit the south eastern coast of India, at a small fishing village called Nagapattinam. She was one of the first children taken into this amazing couple’s home, and even they had lost their own three children in the floods. The girl lost her parents, and today has grown into a sweet sweet girl with the dream to be a teacher. Another child, Mani, is a sweet boy that is around 9, but can see malnourishment has effected his physical development. His father had a huge substance use issue; and his mother had a mental breakdown and to this day has gone missing. His grandparents are too old to care for Mani and his sister, and heard about Nambikkai (meaning Hands of Hope) where orphan kids could live and be supported to go to school right up to college. It has been a beautiful experience finally meeting all the children who my family have been supporting for over 5 years. The couple have an army of cooks and helpers who dedicated their lives and working careers to the cause, as the couple still continue to work full time while being parents to almost 40 kids from 5-25 years of age. I can’t understand a word of Tamil, but I can understand a smile, and the holding of a small hand. To give a child hope and support them to live the fullest life is a great great honour. Humbled again by being here with them. It’s easy to get excited telling people that you’re visiting an orphanage and are going to stay there a couple nights, not thinking too hard about what you may find. Yet I found myself in a very rural village, about 3 hours drive from the closest airport, and an hour drive from the nearest major town. But the school where I was staying was a 10-15min drive even from the village centre. It was a shock to the system realising I couldn’t just get away with wearing a long skirt, I needed leggings to completely cover my skin. Big morale leaving those with my major baggage in Ludhiana. They asked me if I wanted to go to town, I said I don’t really fancy seeing more similar shopfronts, why don’t we go to the slums- not even thinking! So I borrowed some traditional clothes to completely cover my elbows and ankles, and a couple of the boys rode motorbikes to the slums from which the children resided prior to coming to Morning Star. My second motorbike ride had requested me to side saddle (apparently the woman is to only ride this way haha). We got over the railway tracks and were led through well ridden dirt trails to our first stop. Some of the kids were already back home, as the orphanage school allows kids from the local slum to attend as day students, while the majority reside there. The railway was important. Sometimes a rice train would go by and the older kids would learn how to jump on the back and steal a bag so that they could eat for a few weeks at a time. Neyma. About 3 years old, but can’t be sure, she only knows if she was born in the hot or cold season and due to malnourishment and lack of education it’s difficult to determine age. The orphange gives her a DOB regardless & celebrate it. She was beaming when she saw me, proud to show where she lived. Yes it was made from large tree branches, plastic tarp, dirt floor, well-worn clothes lying about. She held my hand for the next couple hours as we met each family, and watched the sun go down in the background. There were kids playing in dirt completely naked. There was a young mum caring for two toddlers, one crawling away crying and crying. The mother instinct in me wanted to silence it, but I just watched her cry and cry til an older child carried her with difficulty back to her mum. Attachment didn’t seem to be there. No surprise though, these humans are so often in survival mode that their brains are constantly using their limbic system, and the development of their prefrontal cortex is limited. As long as you could put a bit of food in their belly and wash them, they hoped they’d grow. But with limited nutrition, each baby I saw had at least one sign of malnourishment. Whether it be bloated bellies, stunted growth, small heads, lightened hair. It was heartbreaking. I had to do something, I thought. This is a community that have been here over 30 years, have travelled from a different region but have learnt basic punjabi to exist in the community. The school was a glimmer of hope for children to be able to learn to read and write and dream about being a nurse or a mechanic. They wouldn’t even know what these occupations were if it weren’t for the school. Some of the stories of the children I met and spent time with were life changing to hear. I’ll be sharing them in my next post. There’s always hope. Even in the midst of chaos and devastation. This was the day I did not know I’d be seeing these doors with my own eyes. They had be published in many magazines both fashion and travel ones all over the world. Iconic for their intricate detailed Doors, colourful hues hand painted designed for a king to enjoy. I bought a pin board last year inspired by the Pinterest app, wanting to put up photos of memories, inspiration and goals. I had found a photo of this door in India that was so beautiful I had wondered where it was. I ripped it out of the magazine and put it on my board. Yes I wanted to always go to India but I never knew when and lacked the determination at the time to go. It seemed like it would be a far off reality. We started the day heading into the main part of town, where a monument called the Jantar Mantar was. It was one of 5 built in India, a collection of different large-scale tools to measure things like the altitude of clelestial objects, telling the time using the sun. It was incredible. The site built in Jaipur was the only one fully completed, so I was glad to wait til I got here to explore it. We wandered over to City Palace of which there were two options of tours, visiting the museum $500 rupee or going inside the royal palace which was $2500 rupee. Okay a big price difference right? So what was the big deal? Well it included a private tour guide, tea/coffee refreshments, entering in 5 different sections of the palace which is still occupied by the current king of Jaipur- who in fact is only 18 years old! I saw a few photos displayed at the booth and then realised, wait this may actually be the place these doors existed. I scrambled for my phone and scrolled through the photo of the door I put on my board. I showed it to the ticket seller and he nodded! He said I would see it inside and that I would be allowed to take photos. That 2500 rupee didn’t sound like that much after all. I had to see it. 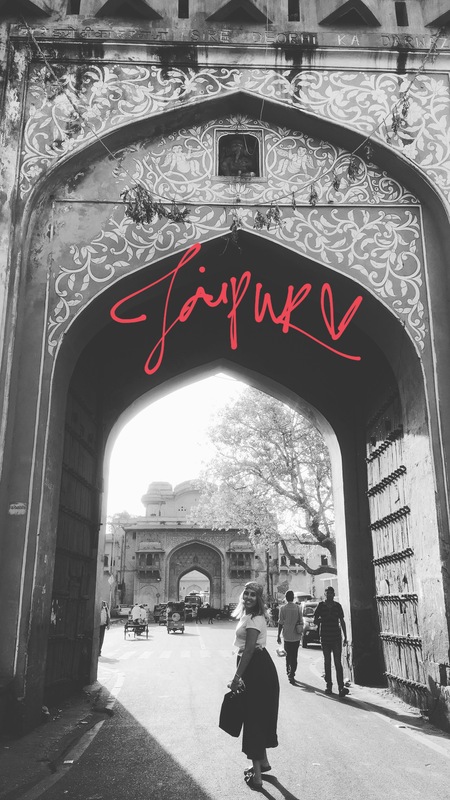 It was why I was here in Rajasthan- to be completely inspired and in awe of the beauty this state represented. It was a priceless experience. And the photos I would take would be absolute magic! We were introduced to our friendly guide who took us through the main gate guarded by red clothed men, into the public forum where massive jars of pure silver were placed between beautiful columns stood. The guard told us that these jars were once carried across desert filled with water for the King to drink as he made his way to other cities for meetings. We went into a lift up to the 7th and highest level, embraced the views of the city and forts hidden in mountains, walked through the Blue room, where certain parties are held, a lounge room filled with mattresses and cushions covered in velvet. Walls were imprinted with mirrors in the days where only candles lit up rooms and gave a night sky effect. The palace was filled with wonder. Then the doors. There were four, one representing each season. They entered different sections of the palace, place each on a different wall of an open courtyard. Patterns of peacocks and lotus flowers surrounded the arches of the deep gold doors. My camera could not pick up every hue. This is the part of the trip I’ve been anticipating for: exploring Rajasthan and it’s beauty, handiwork & palaces. We caught a morning flight from Delhi airport to Jaipur, and the hotel which is in the main part of time we found out was 22km away. We thought we would have a go at ordering an Uber! And we did!! Key difference to home is the payment doesn’t go through the app, you pay cash upon arrival- don’t quite get how that’s any different to normal taxis but it was slightly cheaper haha. It was much more rugged, country style to what I had expeitirnced in Delhi. And buildings were painted all sorts of pastel colours, pinks, greens and blues. The women wore bright bright saris everywhere full of sequins and beads. We got to a hotel booked through a mutual friend. Their hospitality was beautiful. So thoughtful and caring, we got the hotel at a discounted rate and the beds felt lush! We took our time planning out what we really wanted to see in the city. Funny though how reviews can be misleading, still we put a list together to make the most of our time here. It was hot. Hotter and drier then Delhi. You could feel the dust in your hair and skin. I didn’t mind at all! We were starved so we started walking to find a restaurant nearby. Of course picking from the Rajasthani specialty menu. I found myself keep drawing to butter naans! They’re just too good here. Lime sodas is also a popular street side drink, salty or sweet. We headed into the main part of town to a palace called Hawa Mahal. It is iconic for its tall screen wall with many windows that was built specifically for women to observe street festivals without being seen by men. We had so much fun, smiling and waving hello at kids on their way home from school, making shop keepers laugh when I kept coming back buying more tasty milkshakes. Hi fiving kids riding motorbikes alongside me in traffic. The most fulfilling feeling on earth leaving a slice of joy whenever I go, regardless of how I feel. After getting distracted for hours in local markets by colourful bags and materials and finding some beautiful gifts to take home, we got to our hotel. There we met the hotel manager who was so kind and generous to give us a great rate on our hotel which was placed very well among all the local monuments and sites. I couldn’t be more happy to lay my head on a pillow that night after washing the dust off. 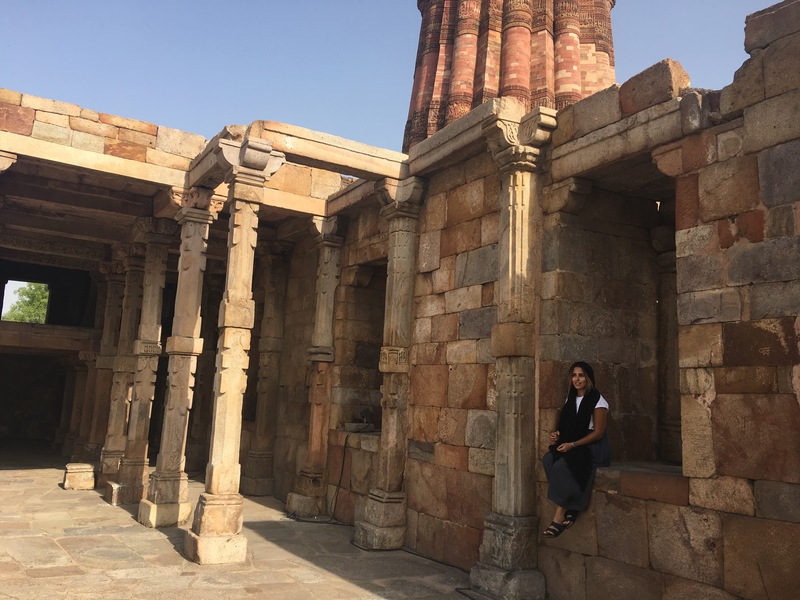 It was our last day in Delhi for a little while, and I decided I really wanted to make the most of it taking the reigns of the days plans. We get to breakfast and I decided to be a bit more adventurous and trusting of the cooks, taking a bowl of porridge cooked up at the buffet. It had fresh sliced coconut in it. It was heaven. I just love finding delicious foods that I will keep forever in my mind to cook again! This one was one of those special experiences haha. I did abit of research online, noticing there was many mixed comments on blogs and sites on various different things. It’s typical of the contrasts in 1 star travellers versus those who only want to stay 5 star. I decided to ignore them and judge based on photography. After all this is what I wanted to do, photograph some of the best images I possibly could. First stop was Urgesen Ki Bioli. Used for scenes in Bollywood films, this 60m long and who knows how deep water reservoir was built by the king in early centuries as the city’s main water supply. Also known for being haunted; home to a few hundred pidgeons, we walked its steps and took some incredible photos. It was probably the first free entry site I had gone to! And only a few people there when we arrived. The Bioli felt like a little escape from the chaos of Delhi, as it was tucked in around so many buildings and streets. Next, we went to Ghandi Butri. This was the garden where Ghandi was martyred, and since preserved the residence and have created memorial and a great educational display to talk about how Mahatma’s journey began and some of the major events he was apart of that made him so great. It was the highlight of my trip this far, I just wanted to buy every book I could find about him then and there. Such an inspiring man who lived a simple life and did braves brave things to fight for injustice no matter what the punishment he could face from the world. And ultimately it lead to his death one day as he sat in his garden to pray. I loved the mosaic depiction of his life story that people created in his memory, and original letters copied on display to read. He was such a smart, intelligent man, who although living in the world, was so set apart from it. His quotes I hold dear to heart. Salute! Next, we took a detour to some markets, this time we had a crack at jumping on a local bus not having paid a ticket! 😂 Serves us right, it was going the wrong way and we realised too late when asking some kind locals. What was meant to be will be & we found ourselves going to Palika Markets, Delhi’s underground markets. It was crazy. Every single guy at a market stall would walk out in front of me and ask if I would like to buy a belt or dress or earrings! It was like a simulated computer game! Had to keep ignoring them all, keep walking, keep looking for something that caught my eye. We picked up a few earrings but decided we need to get out of there, an hour was long enough. We jumped in an auto and went to the National Gallery of Modern Art. I was so curious to see some of India’s art history. So many influences from minimalism, post modern, modern, pop art and contemporary eras- it was just so inspiring & creative. India has some incredible drawers that use linoprints, pen, ink and paper. The simplest of tools yet the quality of work was next level. So many different depictions of Indian traditional arts as well as true images of the country’s landscape and people. So many creative ideas came to mind- first one was the simple fact that I need to start painting and drawing again. I truly loved every time I had my art class in my senior school years. It was an escape, a way to switch off the logical mind and space out into dreams and ideas. Refreshing is the word. Like a waterfall 😉. Talking about refreshing, after 2 hours of being inspired by 7 levels of art, I just wanted to swim in a pool. So we went back to our hostel and got to the pool next door. What an experience. I was more conscious then ever, being careful of my legs and shoulders being exposed. Women and men had different entries to the pool as you had to walk through the change room and showers first. We sat there having a swim, cooling down and chatting under palm trees watching the sun go down. I can’t tell you how, but we had the energy to go out again, but I left majority of my money st home only realising once I had bartered down a couple of dresses at the CP markets. Everyone must go check these ones out. You will be entertained by the amount of good quality Fakadidas and sport brand items there are to choose from! Not to mention the quality sunglasses too! We had so many giggles that night, laughing with shop owners paying the bare minimum for products cause we were on the tightest budget between the both of us! We definitely slept well that night. And I managed to take home a couple of comfy Nike ticked cotton dresses to wear back at home. Early flight the next day, we had to catch a train to the airport by 7am to move to Rajasthan. I was so excited I barely slept. There’s one thing I haven’t mentioned about India- how incredible the tea is. Brewed to perfection; right about of spice, milk and sugar. But the teacups are so small. I need 4 cups to satisfy a morning hunger. We woke early to tea, jam and toast at 6am as we needed to walk to Delhi tourisms office conveniently a 15min walk away. I enjoyed that walk so much, only monkeys and dogs stirred at that time on the streets. It’s pretty hilarious watching the dogs bark at them rustling high up in the streets. A lot of homeless people had left their sidewalk beds (for lack of a better word). We jumped into the bus, only about 8 of us there. We had a nicuraguan, Filipino, polish couple and a few other nationals on our trip. Early on in our 4hour journey we stopped by the side of a highway to get some fresh green coconut juice, and quickly an old man selling handmade peacock feather fans jumped at my window sticking one in my face trying to sell at 20 rupee a piece. It’s funny how in a couple of days you get accustomed to the local currency and start feeling like a tightass haha. I should’ve bought one because they looked so pretty- idiot- they were only 50c in AUD! Ah well, plenty opportunity to find another street side hustler on my trip. We got to the Taj warned about how professional the street hustlers would be. After all about 50000 people come to see the Taj per day. You can understand- probably one of the worlds best commercial real estate locations! Upon entry, we were seperated into men’s and women’s lines and frisked by security. This is standard upon entering any tourist site AND train station. The building was magnificent. Completely made from marble from Rajasthan & intricate filigree designs with semi precious stones engraved into its pillars and eaves. To go inside and see the tomb of the King and his third wife- whom he made the site for- was breathtaking. We were strictly told to wear shoe coverings upon stepping onto the marble to preserve it as much as possible. You don’t know how hard it was getting a photo without hundreds of people in the shot. I had to jump a railing to get one haha after being told off by people who really just wanted to follow suit. I would do a yoga pose and everyone would start copying me once it was their turn for a photo. I would just laugh. It was a compliment. I’ve been thinking how much people are like sheep, they strive to be like those they admire- how true is that in any culture. The Indians want to be fair skinned- a symbol of status and working inside rather then on farms and in the field. They have skin bleaching products and will often use filters on photos that brighten their face. When on the other side of the world I’m sleeping like a lizard working on getting a couple shades darker. Going to my favourite Acai bowl cafe on the Gold Coast and I will fit in like a fly on the wall, but here everyone wants a photo with me, it’s just such a paradox. I’ve always wanted to be different. Since I was a kid I’d be following a completely opposite football team to everyone at school just because. Haha. I hope I never change. We then went onto Agra fort. We entered sections of the palace where the king could look out onto his balcony, past Jahmuna river and onto the Taj Mahal and forever remember his wife where she laid rest. More rustic sandstone beauty everywhere. Symmetrical columns, peeling paint, I loved how beautifully ruined it was, eroding with time. At the entry of Agra Fort we were also surrounded by those hustlers, this time they took form of 4yo kids I kid you not. A girl was chasing a boy away because she seemed like she had dibs on our bus first. My heart broke. I cried on the bus home thinking how much need and despair there is here- people just exist in dirt like stray animals and accept the beggar life from a young age. I learnt a valuable lesson that day- you just cannot help everyone. This spoke more to me than here in India surrounded by beggars and orphans. This rang loud and true to my life back in Sydney. Working as a social worker where helping others is what you do, day in day out in many aspects- whether advocating, empowering, helping others access services, become aware of their symptoms and educate them to appropriate treatment and see their goals reached and make steps forward in life- I couldn’t help everyone. Thinking unconsciously that can, or that you have to- was just going to lead to burning out and resenting the profession you were so passionate about. Enduarance is all about lasting the journey. Passion gets you going but persistence, character and attitude gets you there. Never giving up is all about choosing to not let fail be an option. Lots to ponder on as we got back to town at 930pm and walked home. My handbag never felt so heavy after an insanely hot day walking around. Can’t tell you how good I slept. The Kings cared very much about water and monuments. Both were learnt in my second day in Delhi. I will get to that soon, but let’s start at the beginning. We woke up to plans of a packed out day. Indian mornings are stunning. The light is a soft blue-orange. Yes if you’ve been here before you know what I’m on about. I love running out to the balcony to see the sky and breathing fresh air. It was good. Especially from 4 floors up. Our first stop was Red Fort in the heart of Old Delhi. We decided to take the low road today, as yesterday’s driver ended up a bit exxy (rupees wise) with all his hidden parking costs. We were a 10min walk from the local metro (also built by the British, complete with the audio of a woman telling you to MIND THE GAP 😂). Yes the train was squashy. No it wasn’t smelly. Yes more stares. It was fun! Never expect to sit though. Once we got back to ground zero we jumped in a little Auto aka Tuk Tuk. Now I could finally experience the streets of Delhi front row style. Dust in your face, horns beeping everywhere. It’s easy to practice mindfulness but it sure doesn’t keep you calm! War. We got to red fort and it was just breathtaking. Kings of the 17th C occupied the magnificent buildings behind it. There was much history of the Indian army behind these walls, and its last occupants were soldiers, with the Brits building 18C barracks in the area. Water canals. They ran through and connected every building there was inside. They were used as early day air conditioning units to cool the rooms down. There were fountains and pools to sit beside everywhere too. We walked through columns and buildings known as the late king’s court and balconies from which people would watch lions in a duel. It felt like magic. Then there were the street selling carts loaded with litres of Water with minerals. I kid you not, I probably smashed about 5 litres of water in one day of walking. And I certainly did not feel like sweated the same amount out! The dry heat is bearable, but you will feel faint if you don’t keep replenishing. Even a sneaky sweet Lychee juice keeps you going. Next stop was the mosque at Jama Masjid. We had to barter down the price of the auto to get there. My blonde hair and relative tall frame does not help me in this way. Hilarious though, how the land of peace, zen and Ghandi is occupied by bartering, loud talking, arguing and horn beeping. At the mosque I saw a few more foreigners, and we all were given a colourful dress to wear inside. I need to stop and point out here that in India, foreigners are charged 500 rupees for entry to sites (approx $10AUD) and Indian nationals are charged 30 rupees (70c!). There’s no justice here, only acceptance. I found myself sitting at one of those pools washing my feet with a couple of cute little girls smiling at me. It was fun introducing each other. I felt God occupied this place. Beauty and peace surrounded me. I took a few snaps with locals at their request and instantly felt better inside for it. After all it costs nothing to smile- and I felt I had all the time in the world for them. Next stop was my first local restaurant experience at Kuchin Mahajan- except we had to drive through an arcade with a roof of exposed wires and market stalls. So much fun! The food was so tasty. Paneer (tofu curry) was going to be ordered again 😍. Pause; Stop; Think. Big words for this big trip of mine. Qutub Minar. After 40min in heavy traffic trying to get to the other side of town, we made it to this tall sky scraping monument surrounding it huge arches and pillars with broken pieces of relics. It was such a beautiful place to photograph, as the afternoon sun was soft & shadows took lovely shapes. Here we found moments of silence amidst thousands of people crawling the place. As we walked out, we had a man pestering us to get into his auto. He followed up across the road while we bought fresh water. I judged. I saw the scars on his face, his teeth and scrawny figure and just wanted to keep moving. He turned out to be the most personable, funny, entertaining driver so far. He even let us learn to drive his auto! He charged 2 rupee but I just gave him 50, I didn’t care, he made us smile and have a giggle forgetting how tired we were. Sunsets. At last i was determined to see the sun set over India gate. It was stunning, and filled with quite an atmospheric crowd. Not to mention crazy toys, henna tattoo ladies & fake professional photographers offering their services. I felt safe, I felt homely. I didn’t mind walking home in the dark as we did to be honest with you. Trips to Hong Kong and Malaysia unknowingly geared me up for this place. I felt fearless again. A feeling I felt I lost after the personal hardships of the past year that lead me upto this point. Healing. That’s what it was. How can chaos, poverty & beauty exist together as it does in India? I landed here in Delhi around 6am local time, and I could see the sun creeping up over the horizon. After multiple questions at customs about why I have a Hindi middle name, and being referred to as a doctor (as apparently people who work in the field of psychology in India are often referred to as doctors haha), I walked outside to see a stunning orange haze in the sky. Stares. I was expecting this. I just continued to look past swiftly as soon as a pair of eyes would lock mine. I didn’t know how bad this was going to get on my trip but for now I could handle it. I was just trying to find this young nurse who had taken time off to travel with me. 40 minutes and no luck so far. After a couple of lost Germans asked me if I managed to jump onto local wifi, and having a bit of a laugh at how I pronounce words, and I totally forgot about being lost. Turns out one of them was here to shoot a commercial for one of Indias famous fitness models (hilarious). Aruna managed to spot me, I looked like a sore thumb to be honest- and I took the Germans with us to our booked taxi to drop them to their hostel. They couldn’t be more grateful. Yeah we chatted about football and ultras and pyro 😂, exchanged FB details & being thanked for saving them, they were on their way. Yoga on the side of the highway, continual beeping horns, hundreds of people napping on median strips under trees in the shade- this was all soon going to be normal to spot. Stairs. Our first stop was the world heritage site of Humayun’s Tomb. I was mesmerised by the amount of gates and gardens you had to pass through to get to it. The cobblestone stairs were deep and steep. The ability of humanity generations ago humbles the technology-saturated world we live in today. I felt home. Now I get why I love marble wonders, calligraphy, old wooden doors, rustic metals and coloured fabrics. The tomb was full of marble beauty. I haven’t been in such a glorified tomb before. Nor asked so many times to take a photo WITH strangers. I kept saying no because I knew it wouldn’t be in my best interest to welcome any sort of attention. But when a 9yo boy came and asked politely and I said no quickly, I walked away and felt bad. A child’s innocence pulled my heartstrings. This city is full of people trying to take opportunities when they present themselves. I understand why. They feel the grass is geeener everywhere else but here. I know I have to be careful, my heart is big and my generosity can be exploited for someone’s gain. Kids are taught how to pick pockets using their innocent eyes. It was a beautiful first day in this city. 75 million people coexist in utter madness. The poorest of women wear bright beautiful fabrics. I will be walking a lot on this trip. Can’t wait to open some magnificent doors along the way.